This cute little wedding invite could be the front cover of a best selling romantic novel, so why not have your guests ‘Oohing’ and ‘Ahhing’ and offer them an insight into your own love story with the beautifully romantic Folk Love postcard wedding invitation by Ditsy Chic. 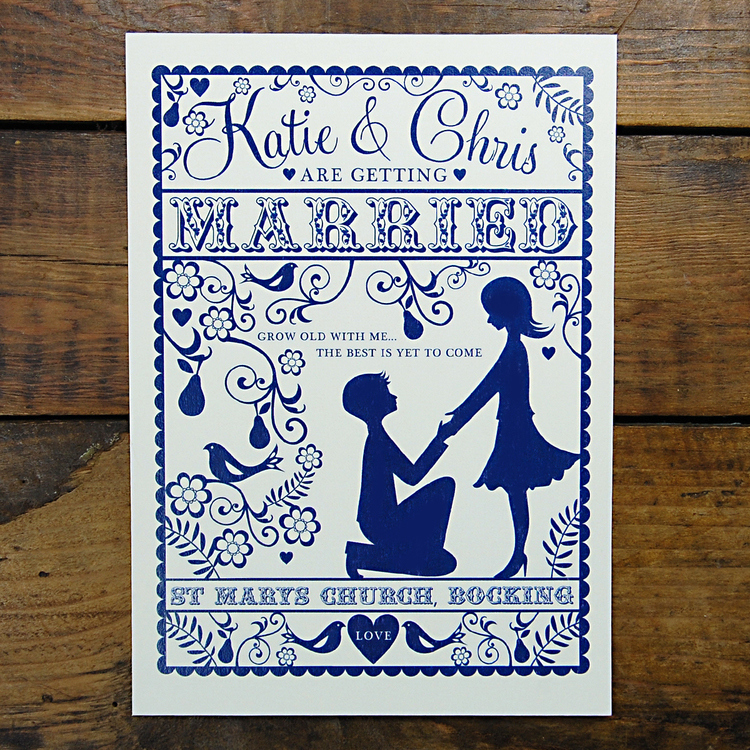 The illustration used on this design is super cute and totally loved up, just perfect for your big day. Folk Love offers a unique alternative to traditional wedding invitations whilst still providing a timeless and classic look that could easily grace the cover sheet of any best selling novel! Utilising a postcard style, your details are printed on both the front and the reverse. The Bride and Groom’s names are written at the very top in a romantic font, followed by the proclamation ‘Are Getting Married’. Two little hearts seal the deal whilst the circus style font used for the word ‘Married’ suggests there’s a lot of fun to be had on the day! In amongst a simple scalloped edged border grows a healthy vine which offers pears, pretty flowers and perches for little birds. Enough to bring you to happy tears, the sentiment ’Grow old with me… the best is yet to come’ appears above a couple deeply in love. The Groom sits on one knee, taking the hand of his stunning Bride, dressed in a pretty summer skirt and sassy heels. Perhaps suggestive of the beginning of this love story, when the couple got engaged? Your wedding date and venue information is all printed on the reverse inside the same scalloped border. You can choose from a variety of colours to suit your wedding theme, ensuring everything is beautifully coordinated – perfect! This invitation is produced from 100% ECF fibre, so you can be sure that your invitations have been made using paper sourced from sustainable forests. Tags: Love Birds, Scalloped, Sustainable Forests, Wedding Proposal.